Chinese “soup noodles” Seattle style: where do you go? Funny how time and place can affect my eating habits. When it comes to what I lovingly refer to as “soup noodle” houses, joints that specialize in the Chinese answer to Bubbie’s finest, I tend to favor one place for a while, then throw it over for another. When I moved to Seattle 20-some years ago, I regularly hung out at the noodle cafe to the left of the big stairway at Ocean City in the ID. Later shining it on for Canton Wonton House across the street. And later still for Hing Loon up the block (which isn’t a “soup noodle” house per se, but a terrific little Chinese restaurant whose chicken stock and sui kau I regularly crave). But somehow in all my slurping, I managed to miss Mike’s Noodle House. Which has been on my radar for a few years, though until yesterday — when I was in sorely in need of a restorative bowl of something — I’d never zeroed in on it. Not to bust chops on any of my other soup-noodle haunts, but I’m here to say that the friends who’ve recently harrumphed, “What? You’ve never been to Mike’s? Whatsamatter with you?” were clearly right. 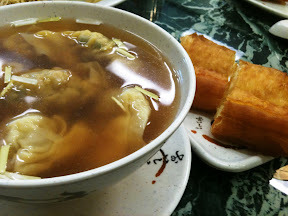 My wonton and sui kau soup ($5.35 plus tax) was as good as it gets around here. Mike’s, with a dozen tables, was filled — at 3:30 p.m. no less — and I had the great pleasure of watching a worker at the next table stuff noodle-wrappers by hand while two prettily uniformed waitresses brought out steaming bowls full of noodle-y soups and variations on the congee theme, that rice porridge spiked with everything from dried oysters to pork liver. 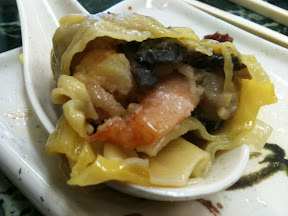 If I were sitting in the Seattle Times office right now instead of in my home office in Edmonds, I’d be on my way back to try something other than my go-to bowl, a combo: wonton and sui kau (the dual-shaped dumplings featured pork and large shrimp in seemingly equal measure). But since I’m not, maybe I’ll high-tail it over to my neighborhood soup-noodle spot, the much welcome newcomer Wonton Noodle House. In the many years since I moved north from the city proper, I’ve been overjoyed by the influx of great Asian restaurants here in Edmonds, many of which I frequent for noodle soups (Than Brothers for pho, Kaya for cold buckwheat noodles and spicy beef-noodle soup, T&T for anything Tony’s putting in a bowl). But as far as I know, this is the only place around proud enough of its specialty product to give it marquee status. Grand opening! Come on in! — to 22315 Highway 99 (a block or so north of 99 Ranch supermarket). “Wontons” you get. But just in case you were wondering what’s inside a sui kau-style “dumpling” (as they call them here) allow me to offer a closer look. As for the proper sides? Gotta have ’em. It’s a wrap! Shrimp, pork, black mushroom. 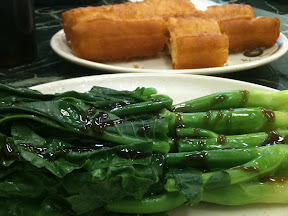 And don’t forget the gailan, plus donuts for dipping into your soup. 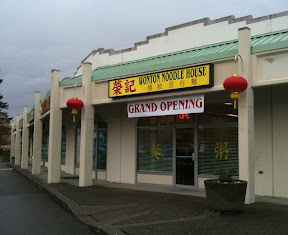 Now tell me: Where do you go for Chinese soup noodles in and around Seattle?